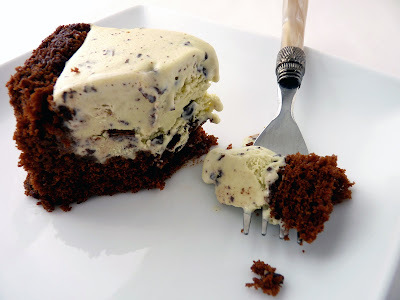 Today brings a lineup of basic ingredients and pastry elements that combine into a cool and refreshing ice cream cake. 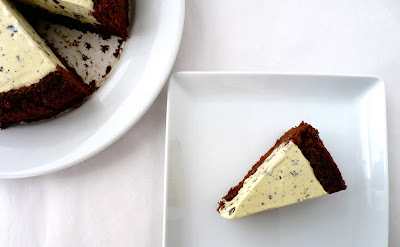 A blast of fresh mint ice cream is embellished with bits of chocolate and embraced with a delicious frame of chocolate cake. This dessert makes a fun centerpiece for an occasion when you want to enjoy very good dessert with very good company. This project took a bit more effort than usual. The construction didn't go as smoothly as I'd planned due to my choice of cake as the base. I'd gone back and forth between deciding to use Flo Braker’s Devil’s Food Cake or a basic chocolate genoise. I went with the Devil’s Food because it’s very moist, tender and full of deep rich cocoa flavor. The cake does have an open crumb and is therefore a bit more difficult to form because it’s very tender. So although the final product is really delicious, it required dealing with some crumbling that I hadn't anticipated. However, it does freeze nicely without having to wait for the cake (and consequently the ice cream) to soften. If you'd like to try this but want an easier approach, my suggestion would be to handle the cake portion as little as possible by either building simple layers in a loaf pan lined with plastic wrap or just making a bottom layer of cake in the springform pan. Or bake the cake in an 8" cake pan for about 20 - 25 minutes and serve the ice cream on the side. The combination is worth producing. The ice cream is made from fresh mint leaves, easily purchased at most markets. Using fresh mint imparts a subtle but true mint flavor with an herbal backnote. 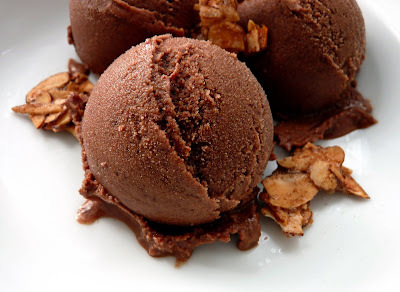 The resulting ice cream pairs nicely with the earthiness of the cocoa in the chocolate cake. What you get is a very nice fresh quality that is an unusual and remarkable dessert when compared with the store bought versions you ordinarily find mass marketed in shops. It all works out to a cool and delicious luxury. - You can prepare this over two days. I made the ice cream base and chilled it overnight. Then on day two, I made and cooled the cake, then cut and formed the cake base in the springform pan and placed in the freezer. Next I churned the ice cream base in my ice cream maker, poured it into the cake base and froze it. 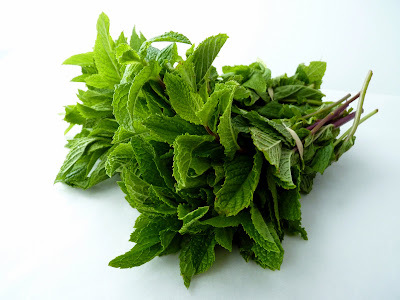 - Look for fresh mint with leaves that are sturdy, bright green and unblemished, preferably organic. I bought two large bundles and weighed the leaves once they’d been stripped from the stem. It’s hard to gauge true volume but 4 oz packed into the measuring cups very tightly and densely amounted to about 3 - 3 1/2 C.
- If your ice cream base tastes flavorful but a bit flat, add a few grains of salt until it pops. The ice cream base may be very different than you’d expect when you first taste it. But once the ice cream is frozen, it’s really delicious. 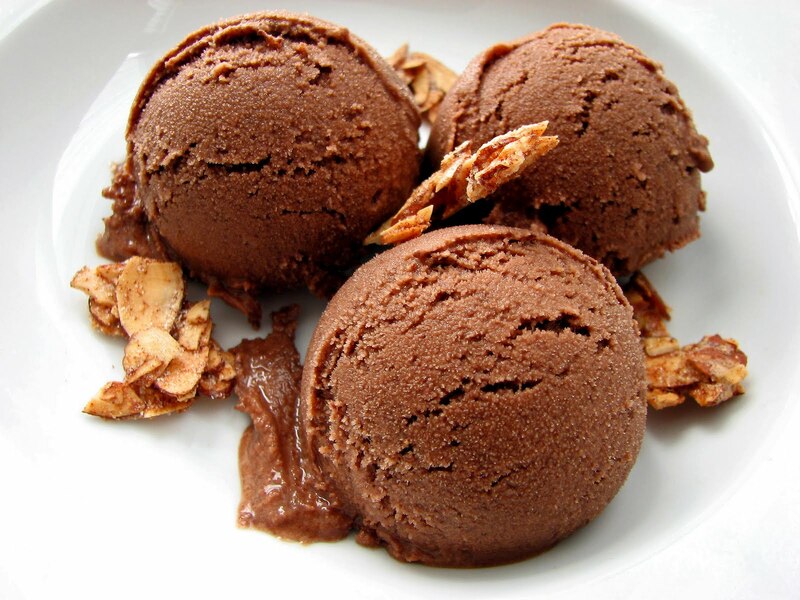 - Don't leave out the chopped chocolate in the ice cream. It lends a nice bit of wonderful chocolate texture. 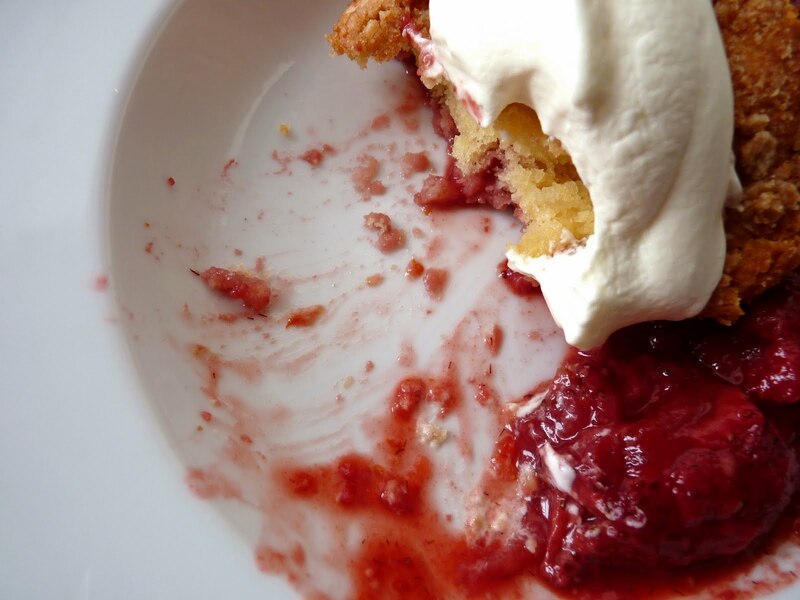 Chop it into fairly fine pieces so it's easy to cut the finished dessert. - The high ratio of sugar to butter in the cake recipe requires you to cream the mixture for about 6 to 7 minutes until it is light in color and fluffy in texture. 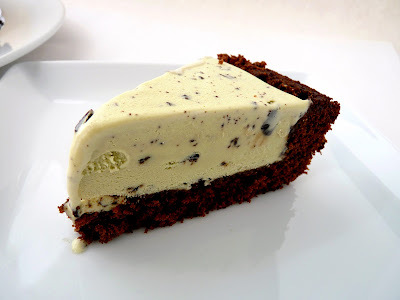 - Use a thin sharp knife to slice the ice cream cake. Run it under very hot water, wipe it dry and slice. Repeat as you go. - Double the recipe for the Devil’s Food Cake, bake in two 8” x 2 1/2” cake pans for about 20 - 25 minutes, add your favorite filling and frosting and you have a fabulous Devil’s Food Layer Cake. For the ice cream, place the milk, cream, 1/2 cup sugar and salt in a saucepan over medium heat until it begins to steam, stirring to be sure the mixture is dissolving. Add the mint leaves and use a spatula to push them down into the liquid so they’re completely submerged. Remove from the heat, cover the saucepan and let the mixture steep for one hour. Strain the mixture, pressing down on the mint leaves with a spoon to extract as much of the liquid as possible. Discard the mint and pour the liquid back into the saucepan. Heat gently until it begins to steam. Whisk the egg yolks with the remaining 1 tablespoon of sugar. Slowly pour the warm liquid into the egg yolks, whisking constantly. Pour the liquid back into the saucepan and cook over medium heat, stirring and scraping the bottom of the pan constantly with a heat-resistant spatula, until the mixture coats the back of a spoon and leaves a clean trace. Immediately pour the custard through a strainer into a clean container and stir to cool. Taste for salt and add a few grains at a time if necessary, to taste. When the mixture is cool, cover and chill thoroughly in the refrigerator, preferably overnight. Freeze the custard in your ice cream maker according to your machine's instructions. Fold in the chopped chocolate and pour into cake form. Freeze until firm. For the Devil's Food Cake, preheat oven to 350 degrees. Grease and line a 13” x 9” x 1” quarter-sheet pan with parchment and dust lightly with flour. Whisk cocoa and 1/4 cup lukewarm water together until thoroughly combined. Blend together the buttermilk, vanilla and 1/4 cup water. Gently add dry ingredients in 3 additions, alternating with buttermilk mixture, beginning and ending with the dry ingredients. Stop mixing just before it is fully blended and finish by folding gently with a rubber spatula until there are no streaks. Be careful not to overmix. Pour into prepared pan and smooth batter evenly. Bake @ 350 for about 13 - 15 minutes or until the cake springs back when lightly touched. Cool completely. Run a knife around the edges to loosen and turn out the cake onto a piece of parchment. Peel off the parchment from the bottom of the cake and flip the cake back over onto some parchment so the top is facing up. To line an 8" springform pan with cake, place an 8” parchment circle as a template on one side of the sheet cake so there is a block of cake remaining to cut out two side panels. Cut out the cake bottom along with the parchment underneath it. Clear away the scraps and the remaining block of cake. Leaving the parchment circle in place, rest the bottom of the springform pan on top of the circle of cake and using the parchment underneath the cake, flip it over so it’s in place on the pan bottom. Slip the springform pan ring around it and snap into place. With the remaining piece of cake, cut out 2 strips about an 1” wide and 8 3/4" long. Line the side of the pan with these strips, gently easing in so the cake doesn’t crack or crumble. Place in the freezer until ready to assemble with ice cream. To serve, run a thin bladed knife gently around the rim of the springform pan. Remove the cake from the pan and onto a serving platter. Serve immediately. 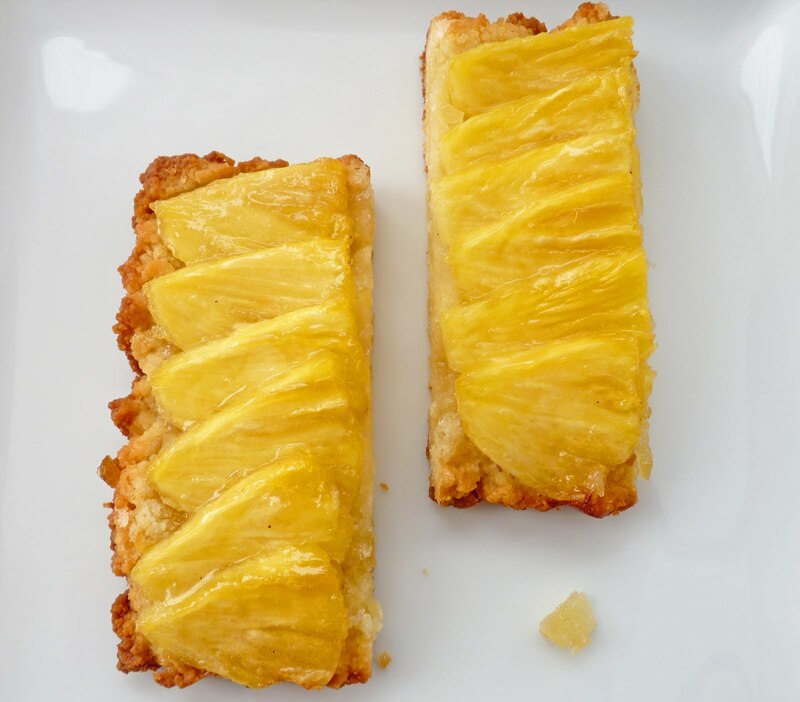 If you’re looking for an unusual brunch addition or a light dessert treat, this recipe produces a bright flash of color and a delicious pastry that glistens with fresh pineapple and crystallized ginger. The gentle heat and spice of the ginger pairs so well with the acidity and sweetness of the pineapple, I wonder to myself why I haven’t done this before. Each bite has more than enough goodness to share with others. The tart dough is a very easy crumble version that requires no rolling or fretting. It’s made quickly in a food processor using just a light touch and then poured into a tart pan and only gently pressed. Layer the top with ripe fruit, bake and you’re set. Couldn’t be easier or more tasty! - This is similar to the dough I used for my Apple Crumble Tart. You can see how the dough should look from the photo there. - As the dough bakes, the butter bubbles up a bit but settles into the crust as it cools after baking. 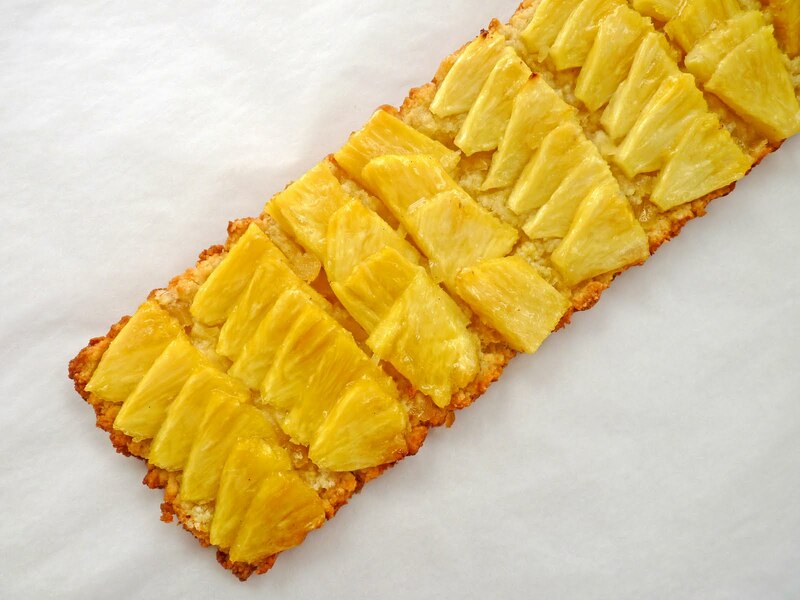 Be sure to place your tart pan on a baking sheet lined with parchment. - For the 1 tablespoon of sugar sprinkled on the finished tart before baking, I used vanilla sugar, which is very easy to produce. I've set aside a jar of sugar to which I add vanilla bean casings after scraping out the seeds used for other purposes. (If they are used for steeping, just wash them after using and let dry first.) Keep adding sugar and casings over time. The casings impart a beautiful vanilla fragrance and flavor. 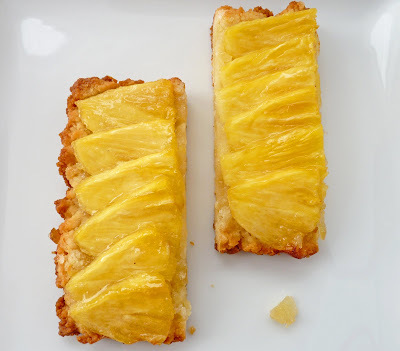 - If you want to glaze the finished tart, you can warm some apricot jam and brush it on the fruit or make a little bit of simple syrup and add some pineapple juice. Preheat your oven to 350 degrees. Prepare a baking sheet pan with parchment. Place the flour, sugar and salt in a food processor and pulse to combine. Add the butter pieces and pulse until the mixture looks like coarse meal, just a few seconds. Mix the egg yolk and sour cream together and add to the food processor. Pulse just a few times. The dough should be very crumbly. Do not overmix. Pour into a large bowl and toss gently with your hands. Evenly distribute the dough crumbles into a 14” x 4” tart pan or a 9” tart pan. Gently spread an even layer without compressing it too much. Just make sure that the crumbs go to the edges of the pan, the pan bottom is covered and there aren’t any gaping holes. Chill in the refrigerator while you finely chop the crystallized ginger. Remove from refrigeration and sprinkle the tart dough with the finely chopped ginger. 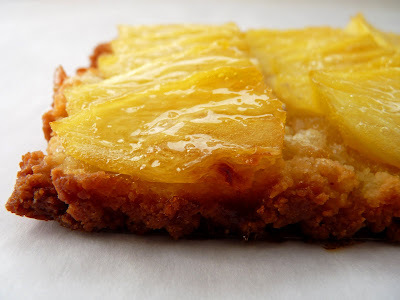 Layer the pineapple pieces on top, overlapping them a bit. Sprinkle with 1 tablespoon of sugar. Place the tart on a sheet pan lined with parchment and bake for about 40 – 45 minutes or until the crust is browned. Cool completely before removing from the tart pan. Strawberry sighting! After a long and wet winter season, suddenly we have the arrival of the first strawberries of spring and not a moment too soon. Bright red, plump, fragrant and juicy, strawberries are a welcome burst of brightness after a long stretch of rain clouds. For me, asparagus and strawberries are the first anticipated bites of spring and I’m enjoying both in great quantities right now. Primavera! Strawberry shortcake is usually the order of the day as warm weather unfolds. This simple cake is another perfect way to enjoy the same elements but with some different textures. The strawberries are baked into a warm jammy lusciousness, tucked safely underneath a delicious cake batter and a crumb topping. It’s part gooey fruit, part dreamy delicious moist cake and part little layer of crisp and crust. Best eaten warm, it’s a really terrific spoon dessert that will add to your favorite spring fruit memories. You’ll see. - The original instructions call for baking the cake at 350 degrees for 1 hour and 15 minutes. My cake was done in about 50 – 55 minutes. Whenever I'm not sure how long to bake something, I usually start checking it around what I think is a reasonable time for the pastry to set and then just keep checking it in 2 - 5 minute intervals depending on the first test. With experience, you'll be able to tell just how much longer a cake needs to bake based on your first test. So check it around the 40 minute mark and see what you think. With this cake you'll be able to tell when to test it by the delicious aroma wafting through your kitchen. A toothpick should come out with just a few moist crumbs attached. - Taste your strawberries to determine how sweet they are and adjust the sugar in the fruit mixture accordingly. 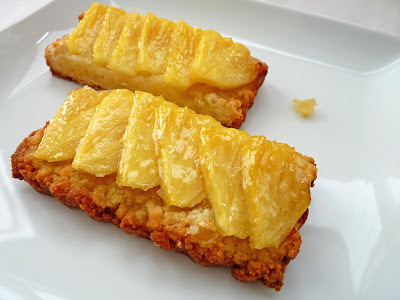 - The recipe calls for this to be baked in a glass pan or ceramic dish. I’m guessing that’s to avoid any chemical reaction of metal cake pans and the highly acidic strawberries. 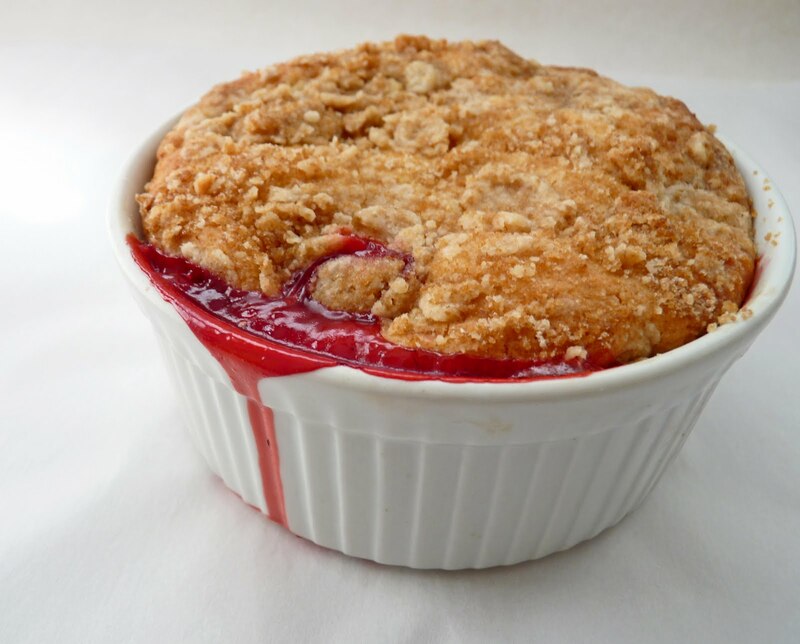 - The baked fruit is thickened just a bit with a cornstarch slurry, which is a mixture of equal parts cornstarch and cold liquid. - If you don’t have a vanilla bean handy for the fruit mixture, use about 1 1/2 – 2 teaspoons vanilla extract. - I also added the grated zest of half an orange to the strawberries. - I made a half recipe and used individual ramekins, which produces 4 – 6 servings, depending on the size of your ramekins. For a half recipe, I used 1 egg plus 1 egg yolk. I also used an ice cream scoop to distribute the batter evenly. Baking time is about 20 – 25 minutes. - For convenience when halving recipes, keep these equivalencies handy: 1/4 C = 4 Tablespoons; 1/3 C = 5 Tablespoons + 1 teaspoon; 1 Tablespoon = 3 teaspoons. 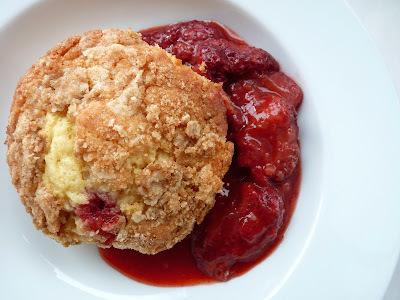 - This is good on its own but also nice with a dollop of whipped cream or crème fraîche. - This would also be a great dessert with any berry or really just about any fruit. Hull and halve the strawberries. Combine the cornstarch and cold water. Toss the strawberries with the sugar, lemon juice, cornstarch slurry, vanilla seeds and orange zest, if using. Let stand for about 30 minutes or so, until the berries release some of their juices. Pour the fruit mixture and juices into a 9"x 13" glass or ceramic baking dish set on a sturdy baking sheet to catch any drips as the fruit bubbles up. For the Crumb Topping, mix all of the ingredients with your fingers until it looks like coarse meal and then press into small clumps. For the cake batter, whisk the flour with the baking powder and salt. Cream the butter and sugar until light and fluffy, about 3 minutes. Add the eggs, one at a time, mixing thoroughly between additions. Scrape down the bowl and add the vanilla extract. Add the dry ingredients to the batter in 3 additions, alternating with half the buttermilk and beginning and ending with the dry ingredients. Mix until just about blended. Finish mixing by hand using a rubber spatula. Spoon the batter over the fruit filling, spreading it to the edges of the pan. Sprinkle the batter evenly with the crumb topping. Transfer to a wire rack to cool slightly. Serve warm or at room temperature. Cheers to spring! 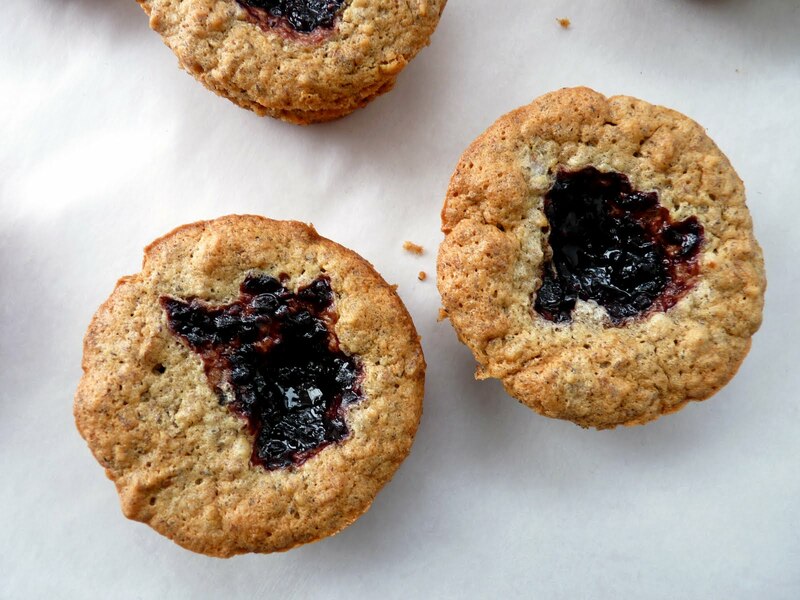 These little snack cakes are made essentially from ground almonds and a bit of the unique flavor of buckwheat flour. Although buckwheat is fairly uncommon in the American diet, it was one of the earliest crops introduced to the United States by Europeans. Buckwheat is actually a fruit seed related to rhubarb. Since it contains no wheat, it's suitable for gluten free diets. It's one of the best sources of plant protein and is rich in magnesium and antioxidants. The buckwheat flower is also a bee magnet and produces great dark honey. I was introduced to buckwheat when I was a college student and lived across the street from a breakfast diner that served buckwheat pancakes. Every now and then my friends and I would meet there and I could never resist ordering that short stack of buckwheat pancakes. They were so fresh and delicious I had no interest in any of the other stuff on the menu. I enjoyed them tremendously with just a dab of fresh berry compote. These little cakes are a way of bringing back that delicious memory. Making them was also a way for me to take a jar of homemade blackberry preserves from my pantry and savor a little prelude to spring. 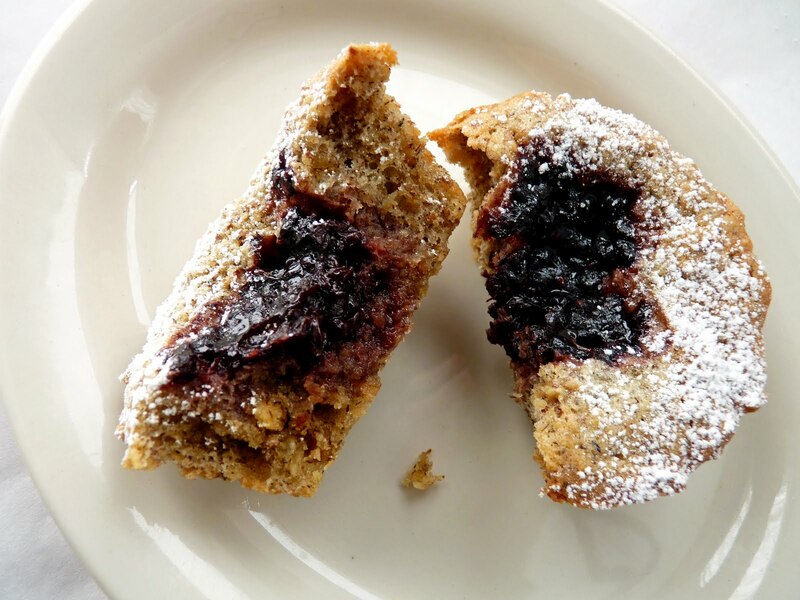 The cakes are moist and tender little treats with an earthy flavor and a very satisfying chewiness. I think the dollop of tart blackberry is the perfect consort. - You're likely to find buckwheat flour in the bulk items section of your market. It should be bought in small quantities and stored in an airtight container in the refrigerator. Bring it to room temperature before using. - Toast almonds by spreading them out on a baking sheet and placing them in a 350 degree oven for about 10 minutes. 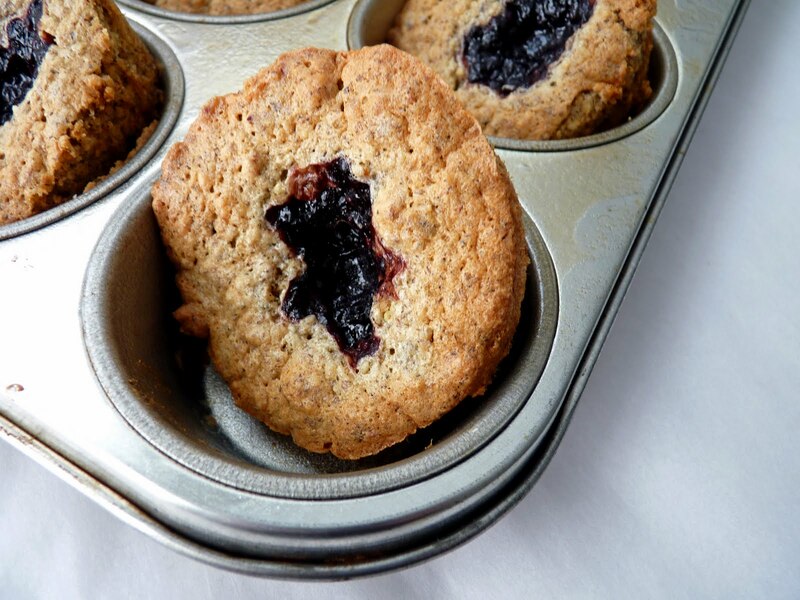 - Be sure to use good quality blackberry or raspberry preserves that do not contain sugar. - I’ve tried this recipe with hazelnuts but the flavors really didn’t work for me. - You can also make this as a 9” cake. Instructions for that are included below. Preheat oven to 350 degrees. Grease two standard muffin pans or one 9” cake pan. Line the 9” cake pan with parchment. Place the almonds, buckwheat flour and salt in a food processor and process until the almonds are finely ground. Pour into a bowl. Beat the butter and 1/2 C sugar until light and fluffy, about 3 minutes. Beat in egg yolks one at a time and mix until each is thoroughly blended. Scrape down the bowl. Add vanilla and combine. Add the almond buckwheat ingredients and mix just until it starts to come together. Take off the mixer and finish mixing by hand. The batter will be very thick. Whip the egg whites until foamy and opaque. Slowly add 1/4 C sugar a little bit at a time and continue beating until they hold a glossy peak that is stiff but still has some lilt. Using a rubber spatula, fold 1/3 of the whites into the batter to loosen it. Fold in another 1/3 of the whites in the same manner. Fold in the last 1/3 a bit more gently. Scoop the batter into 16 of the muffin pans. Spoon about 1 teaspoon of preserves into each one. Bake for about 15 – 17 minutes or until a toothpick inserted tests clean. Cool 10 minutes, then using a small knife to loosen the edges, release the cakes and place on a wire rack to cool thoroughly. If you’re making a 9” cake, bake for about 28 - 30 minutes or until a toothpick inserted tests clean. Cool 10 minutes, then invert the cake. Remove the parchment and turn right side up. Place on a wire rack to cool thoroughly. Slice the cake into two layers. Spread the bottom layer with the preserves. 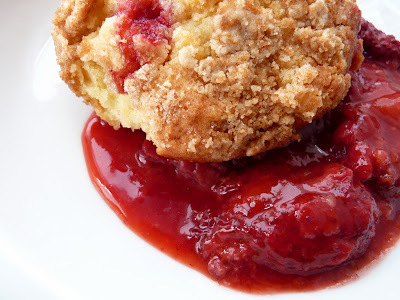 Place the other half on top of the preserves and press down gently to secure. Dust the cake with confectioner’s sugar. This is another very good and very easy recipe from The Perfect Scoop by David Lebovitz, the highly acclaimed ice cream bible for serious lovers of ice cream, sorbet, granita and all kinds of imaginative and luxurious accoutrements. If you like the combination of chocolate and coconut, you’ll more than likely enjoy this simple preparation. 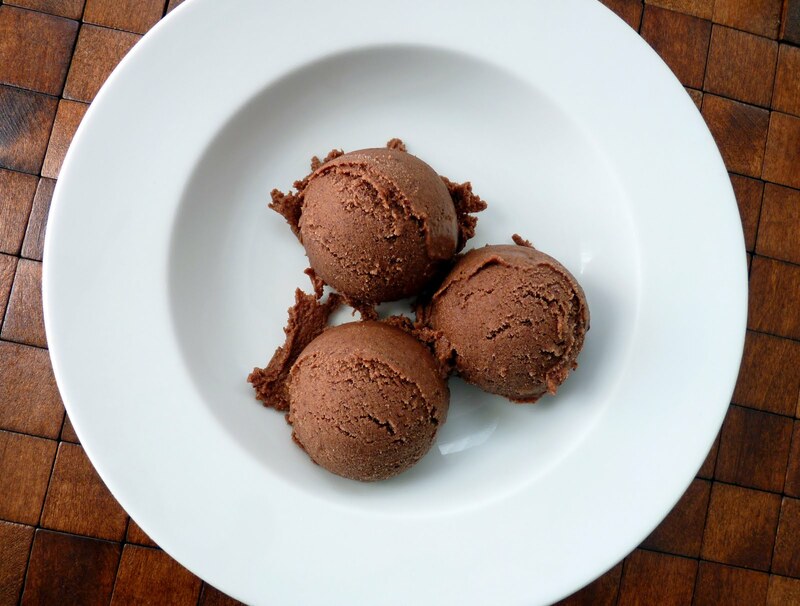 All you do is mix simple syrup with some dark chocolate, add some unsweetened coconut milk, a pinch of salt and vanilla and you have a cool, dark sorbet that is light but full of rich flavor. It's great as is or dressed up in a number of satisfying ways. I’ve garnished this plate with some spiced candied almonds, but you could also embellish with a dab of chocolate sauce or a tiny bit of light caramel or as David points out, it would go well with just about any sort of cookie. I'm tempted to try a bite of crystallized ginger on the side. I'll leave you to your own devices! - For this recipe, you need unsweetened coconut milk, not coconut cream or Coco Lopez, which have a lot of additional sugar. I use Thai Kitchen for its consistent flavor. I’ve tried other brands and they have proven to be really unsuitable. Thai Kitchen cans are 14 oz, which measures out to 1 3/4 cup. If you don’t want to purchase 2 cans and have a lot left over, add one can, taste and add milk if you think the mixture needs it. Otherwise, it’s a non-dairy sorbet. - Use dark bittersweet chocolate for the best balance of flavor and sweetness. - For the spiced nuts, I used cinnamon, ginger and cloves but use your own favorite combination or maybe a fresh blend of Chinese five-spice powder. - In Room for Dessert, David’s first cookbook, he has a version that includes 1 tablespoon of rum instead of the vanilla and only 5 ounces of chocolate. It’s also very good. Chill the mixture thoroughly. Freeze in your ice cream maker according to the manufacturer’s instructions. Pour into a clean airtight container, press a piece of plastic wrap into the surface, cover and place in your freezer to firm up. For the Spiced Almonds, preheat the oven to 300 degrees. Prepare a baking sheet with parchment or a silpat. Whisk the egg white until it’s frothy and opaque. Add spices and salt and whisk to thoroughly combine. Toss in the sliced almonds and coat evenly. Sprinkle with sugar and toss to coat completely. Spread the nuts onto the sheet pan in a single layer. Give another light dusting of sugar. Toast for about 20 – 25 minutes or until they are dry and lightly browned.